#Bizarre #Travel Journal #7: Yule Log??? Have our American parents been giving us the straight Sh** about the holidays???? Catalonian Christmas (Barcelona) has a few customs that could add a few bizarre notes to the typical southern festive celebration. The first involves an enhancement of the revered Nativity scene. You know. The thing with all the pieces you faithfully drag out each year and carefully arrange on the fire place mantel. Although Mary, Joseph and the little guy are mandatory, other figures, like that crowing rooster and that skulking Lucifer you got in Mexico, can be added to make a stunningly elaborate representation of the Holy Family Tradition. The Catalonian addition to this scene is a crouching farmer, sporting a snappy barretina and a red belt over black pants. He is believed to bring luck and joy into the next year. The legend further notes that if you do not include the figure, misfortune may follow. This figure is called the Caganer and, while you’re thinking that grandma wouldn’t mind a little foreign spice in the sacred scene, don’t act too fast. From the front, the farmer only looks a little awkward. But with a quick glance at the back side, you realize something is not quite right. There, in the rear, you are greeted by a bare buttocks and a pile of— well, some might say, Number Two. Wikipedia reports the use of the caganer figure dates to at least the 18th century. In recent years, the phenomenon has seeped into the general culture, with many celebrities now honored by their own figure. The Pope has one, along with Barrack Obama and, we can be certain, Donald Trump. He seems tailor-made for the role. There are many political figures and some are obvious choices, like George W. Bush and Hilary Clinton. The web site http://www.caganer.com proclaims the figures “world famous”. The Queen Elizabeth one is so adorable, yet dignified, in that regal manner. If you are in the area, you can even book factory tours for your kid’s school class. The old adage “only in America” is clearly being one-upped by Spain. Now that we are thinking of the holidays and well-worn traditions, let’s turn to yet another special Catalonian oddity. Most have heard the stories of how Yule Logs bring the family together around the fire as the singular log burns, providing warmth and an opportunity for wholesome conversation, and perhaps a sweet song. Well, this story comes to us via a Barcelonan Tour Guide who apparently did not know another English word for “sh***ing”. Or maybe there is just not another way to discribe this peculiar custom. It took a deep dive into Wikipedia to make sense out of what the guide had said. 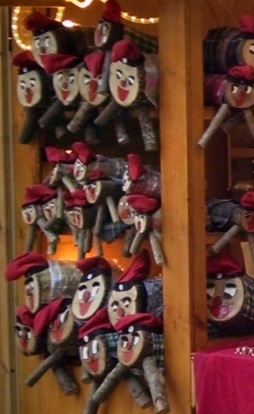 Again, we start with the bright red barretina (Catalan hat), this time atop a log with two spindly stick-legs, and a mawkishly painted smiley face, with menacing eyes and a leering mouth. Called a Christmas log, it is also known as a Caga Tio. Caga, yes, similar to our first topic, this is— apparently there is not other way to say it— the “Sh** Log”. Wikipedia said it with more clarity than the tour guide, who was getting a bit giddy after a grueling tour with a busload of less than agile tourists. The Catalon Christmas log makes its first appearance at the Feast of the Immaculate Conception (December 8th). Each night from then until December 24, the children of the family are responsible for feeding the log by offering it “nuts, dried fruit, and water”. As part of the ritual, they cover the log with a blanket to keep it warm and complacent. I could find no indication of what happens to the food offerings, but it takes little imagination to determine that some parental intercession is required. If done right, with enough faith in the process (and, of course, divine intervention), when the children look under the blanket, they ‘discover’ the log has ‘pooped’ out loads of desirable presents and “piles of candy” (assuming they did the feeding and the beating at appropriate levels). Somehow smelly herring figures into the end of the ceremony when the log is ingloriously thrown upon the fire to be consumed by the flames. There is always a lot to think about during the holidays. Now you have two new unthought-of ideas to enhance your traditions as you venture into the realm of the bizarre.